Around 30 years ago, Margot and Richard Frisius decided to settle down after many years of traveling the world. 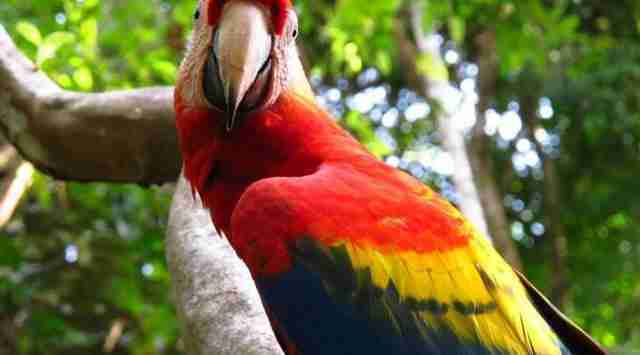 They settled in Rio Segundo de Alajuela, in the center of Costa Rica, where they established a parrot conservation center to help restore the increasing decline of the many magnificent birds native to the country. Many years later in Feb. 2012, the project turned into an official non-governmental organization (NGO). The aim? That has always been to ensure a long term future for wild parrots to roam freely and safely in their historic ranges of Costa Rica. The main two parrots protected by the organization are the scarlet and great green macaws. The scarlet macaw (ara macaw) can be recognized by its beautiful colored feathers of red, yellow and blue with a shade of green in between. The great green macaw (ara ambiguus) is the largest parrot and actually the third heaviest species in the world. The name gives it away, but it is recognized by its green feathers with a turquoise shade on the tips and its red forehead. While both species are internationally classified as endangered, due to the increasing trade in tropical birds, the great green macaw is in particular danger of extinction with a wild population estimated to less than 1,000. The scarlet macaw is a popular species to keep as pet or for captive breeding, while the great green macaw has a more nervous nature and thus rarely seen as a pet. However, one of the main reasons for their endangerment, besides the wild bird trade, is habitat loss. Logging, gold mining, hunting and agriculture all have had an impact on the macaw habitats. Thus natural reservations have crucial importance to the protection and future of all kinds of tropical bird native to the country. The project works in several locations across Costa Rica. While the original breeding center in Alajuela was closed in 2012, a new center was opened in Punta Islita in December 2013. 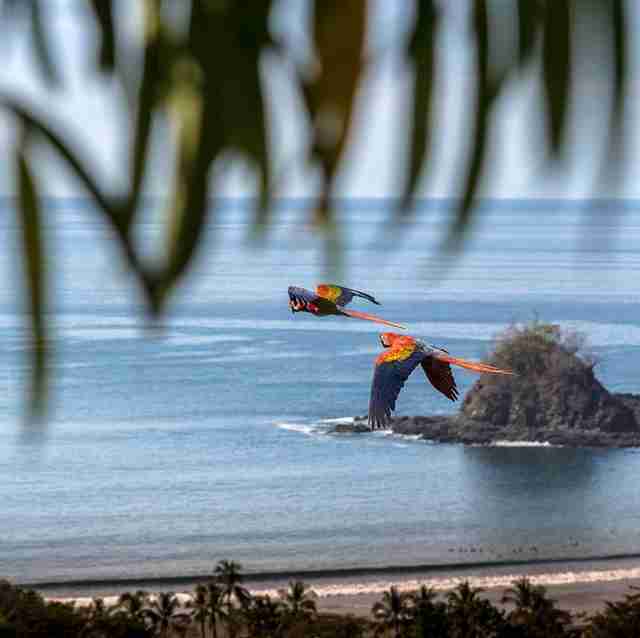 Next to this, the release sites where the macaws are introduced to their natural habitat are located across Costa Rica, including Punta Islita, Manzanillo and Punta Banco. The macaws that arrive at the project include confiscated birds, former pets that have been donated, and birds that have been raised at the center. They are bred at the center, where they are taken care of until they are considered ready for release into their natural habitat. The project applies a "soft method," meaning that the birds will experience a gradual re-introduction to their release, which can take several months. They are still being fed after release at certain monitor points, which assures that they stay safe and healthy. One crucial element in the protection of macaws lies with the local community. The project engages in many ways with the locals to educate and inform about the macaws, and the importance of them staying in the wild. Members of the communities located near the project sites get to enjoy afternoons at the project stations to learn about the introduction programs. Other initiatives include cooperation with the school of veterinary medicine at a local university to assist in keeping the birds healthy; tree planting for macaw food with the local community; and educational activities with school children that often come to visit the project. When Margo Frisius passed away in 2008, it was decided by her husband to pass on the project to the Beruite family and other collaborators, who up until then had been associated with the birds. While it now is a local NGO, the organization still very much relies on help from volunteers. One has to stay for a minimum of one month in which the work can include collection of data, monitoring of macaw releases, feeding and education about macaw conservation. 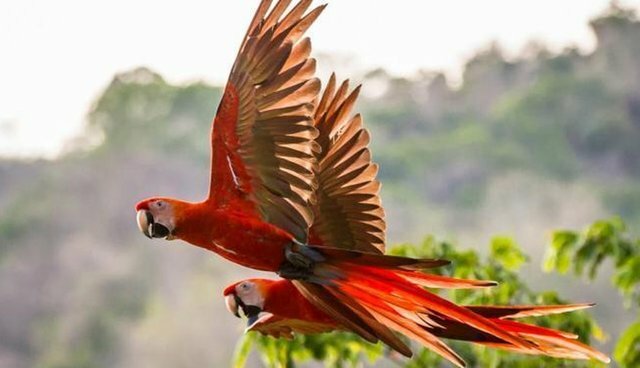 Costa Rica is rich and diverse in nature and wildlife, and not only will one get the chance of experiencing everything that the country has to offer, but you will be doing it while helping to ensure a future for wild macaws in Costa Rica. For more information on volunteering at this project, please click here.